Ray E. Benson, Jr., 78, died Sunday, January 23rd, 2011, after a three-month battle with cancer. Ray attended Davis and Elkins College, graduating in 1955. From then until 1976, he served in the United States Air Force, rising to the rank of major. He was awarded the Air Medal, the Air Force Commendation Medal, the Purple Heart, the Republic of Vietnam Campaign Medal, Vietnam Honor Medal and Armed Forces Honor Medal. He also helped the Sacred Heart orphanage in Da Nang, Vietnam. After the Air Force, Ray worked for GTE in Seneca Falls, NY, then for the Civil Service as an airfield operations manager at Griffiss AFB, Rome, NY, and Homestead AFB, Fla.
Ray enjoyed a wide range of activities and had an ever-curious intellect. His interests included duck hunting, fishing, gardening, bird watching, woodcarving, swimming, golf, investing, astronomy, photography, and military air history. 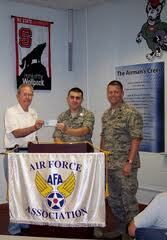 Ray was a member of the American Association of Individual Investors, Military Officers Association of America, American Legion Post 6 in Chapel Hill, Veterans of Foreign Wars C. V. Cummings Chapel Hill Post 9100, and was the current President of the Tar Heel Chapter of the Air Force Association. Tarheel Chapter President Ray Benson (l) presents an Air Force Association matching grant to North Carolina State University ROTC cadet Zachary Jarvis and Det. 595 Commander Lt. Col. Christopher Froeschner.